Capacity increase of 250 for Xunlai Vault material storage. This item increases the capacity of the material storage in your Xunlai Vault by 250. This increase is account-based and will be available to all characters on the same account who have access to the Xunlai Vault and material storage. 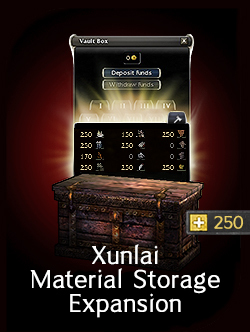 You may purchase a maximum of 9 Xunlai Material Storage Expansions per account.